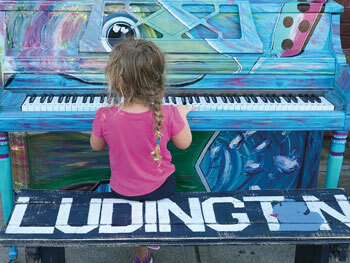 It's not a common sight to see pianos out on the sidewalk, but that's exactly what you'll see in downtown Ludington. These are not just ornamental pianos...they are real, working instruments donated by generous individuals. Each one is colorfully painted and ready for anyone to sit down and "tickle the ivories." In 2017, the first piano was placed outside House of Flavors Restaurant, a popular place in the summertime! Many people took the opportunity to play a few tunes, to the delight of those passing by. This year, five more pianos have been donated. You'll find one outside My Sister's Closet right on Ludington Avenue. Another is at the Ludington Jaycees Mini-Golf Course at the beach, and a third is found at All Occasions Events & Floral in the James Street Plaza. The piano at All Occasions is painted in chalkboard paint so people can leave messages. Ludington Bay Brewing now has a street piano, and you'll also find one in front of Sandcastles Children's Museum, designed by the staff and students at Gateway to Success Academy. Ed Santarelli, Ludrock founder, first got the idea for street pianos while visiting another Michigan town. He felt that the tight-knit community of Ludington would welcome the idea and be the perfect venue. Ed, with his extensive background in music, thinks that when people hear music, they just feel happier. He appreciates the donations of pianos, and is fascinated by the history of each one. So while you're in downtown Ludington this summer shopping, eating, or attending an event, feel free to play a tune and bring some happiness to those around you! Spirit of the Woods Folk Festival in Brethren. Ludington State Park Summer Performances. Nights at the Lights Features Entertainment at the Lighthouses.